After the juggernaut onslaught of The Book of Mormon, for sale another musical has just arrived from Broadway much more unobtrusively — but is even more unmissable. It is in an entirely different emotional register, visit this too: where the Mormons have a literally missionary zeal, viagra 100mg Once creeps under your skin to achieve a kind of ecstasy in its quiet, insistent yearning for life’s missed opportunities, but the lessons we can learn from them. I should caution, however, that it may not be to everybody’s taste: unlike The Book of Mormon, it’s a slow-burner, not an instant riot. Based on the 2006 Irish independent film of the same name, it is about a part-time Dublin guitarist busker (who works by day in his dad’s Hoover repair shop) who falls unexpectedly in love with a young Czech immigrant fellow musician. As we follow their relationship across five short days, big changes happen to both of them in little ways. The show, with its alternately beautiful and rollicking songs by the original stars of the film Glen Hansard and Markéta Irglová, is part concert and part aching unrequited romance that feels at once organic, spontaneous and freshly minted. The brilliant ensemble of actor-musicians make their own music with fantastic spirit and energy, led by the raw, sincere Declan Bennett and the beautiful, tender Zrinka Cviteši?. There’s even an onstage working bar for the audience to mingle with the company before the show and during the interval. This is the most unusual, unique and affecting musical in town. Seeing it once is definitely not enough; I’ll be returning again and again. 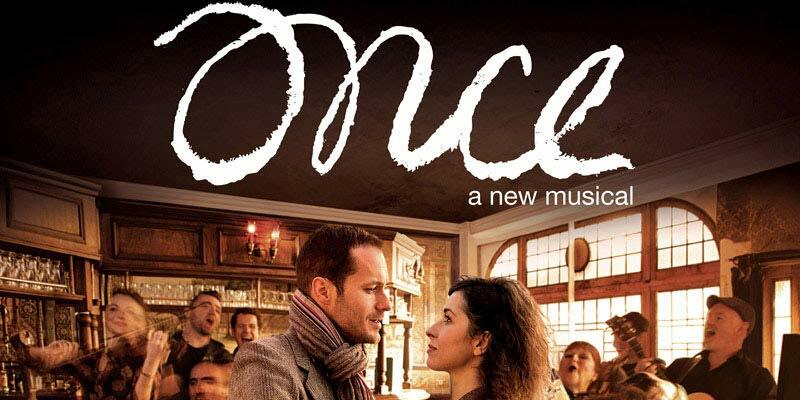 Re-review of Ronan Keating in Once for The Stage.